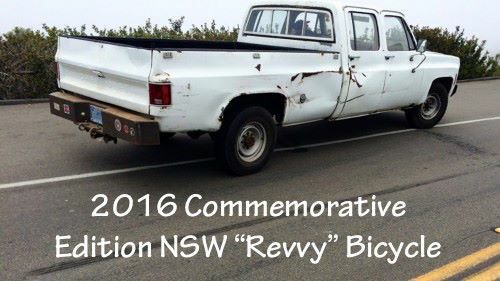 Introducing the 2016 Commemorative Edition NSW “Revvy” Bicycle¹ – brought to you in collaboration with the NSW State Government and the NSW Police. We’ve taken all the things that you love about riding a bike and made it better! We know you love riding along without wasting time finding your ID when stopped by the authorities so the Revvy comes with our License Plate™. The Licence Plate™ is an externally mounted government issued identification so that when our authorities have nothing better to do and randomly stop you they can quickly assess whether to fine you for not displaying your identification. We know you love riding at the early hours of the morning to avoid traffic on Sydney’s dangerous roads so instead of wasting your voice alerting a jaywalking jogger to your presence with a “good morning” you can instead blast our Mandatory Mounted Alerting Device™ to wake up the neighbourhood and save your larynx for the post-ride coffee. We know that you love the feel of the wind in your hair while slowly pottering alongside the beach heading down to the shops so the Revvy comes equiped with our Super Strong Aircon™ to simulate that feeling while wearing your mandatory helmet. Our Super Strong Aircon™ can take you another step closer to hitting your CO2 emission targets and helping Australia proudly lead the world in CO2 emissions. We know that you care about getting around safely so the Revvy comes equipped with a full-body Metal Safety Cage™ ² – it helps keep the air conditioned atmosphere inside, stops you from having to be connected to the outside world and removes the tediousness of chatting with other commuters as they pull up beside you in the congested traffic – plus the added tonne of metal helps you trigger all the green light sensors! We know that the Metal Safety Cage™ decreases visibility around corners so we’ve installed a suite of Safety Mirrors™ and made sure to go that extra step further by having severe penalties to enforce stop signs – we’ve taken the temptation of high visibility away from you. You’re welcome. We know that the added weight of the Metal Safety Cage™, Safety Mirrors™, Super Strong Aircon™ and Mandatory Mounted Alerting Device™ do increase the weight for the Revvy over that of “traditional bikes” but we’re letting you in on a secret, that’s what gives the Revvy it’s name! The Revvy comes equiped with a 200 horsepower engine to help you travel at a consistent 10km above the speed limit while carrying all the extra load. Not only will the Revvy enable you to Go Together™ with other road users at 10km above the speed limit but it will remove the need for us to shift 4 meters worth of Westconnex budget to build that 3% gradient offered by Harbourlink that the “traditional bike riders” will still yearn for. With the Revvy you won’t need Harbourlink. Go ahead and give Revvy’s 200 horsepower Safety Speed Engine™ a whirl as we removed the speed cameras because they don’t have any proven benefit (and in this case we care about proof). We know that you’ve always wanted to travel along safely without having doors suddenly opening into your ribcage. That’s why the Revvy comes with a Beastly Bull Bar™ so that if someone opens their door in your path it’ll probably kill them and both you and the Revvy will survive without even a scratch. We know that stability is important to you and this could be a problem with the addition of the our patented Metal Safety Cage™, Safety Mirrors™, Super Strong Aircon™, Mandatory Mounted Alerting Device™, Safety Speed Engine™ and Beastly Bull Bar™. That’s why the Revvy comes equipped with our innovative Stabilising Safety Wheels™. The two additional Stabilising Safety Wheels™ will help you cruise by at breakneck speed with the our Safety Speed Engine™ carrying all the additional weight you like and helping you to use your fair share of the dangerous roads. Gone will be the days of illegally riding slowly on footpaths while lamenting the lack of decent bike infrastructure because with the Revvy you’ll feel comfortable on our dangerous roads thanks to our Metal Safety Cage™. Sure, you’ll be too wide to use the limited bike infrastructure but now you can while sit back on a cushioned seat while in congestion with the rest of us. You can pass the time in Sydney congestion using the Revvy’s built in Radical Radio™. Sit and enjoy the easy listening of AM talkback radio – you’ll be educated on why it’s totally normal to be bigoted and narrow-minded, it’s the NSW way and now you can be 100% part of the Groupthink Gang™. While listening to these fresh ideas you can sit texting with your mates about how right they are.Don’t worry about now being forced onto the roads, we’ve got billions to spend on building new tollways, and while sitting in the induced congestion you’ll even get to experience the schadenfreude of watching those ghastly people on “traditional bikes” get what’s coming to them as they’re randomly stopped to produce their government issued identification.Now that you feel safe to ride on Sydney’s dangerous roads thanks to our Metal Safety Cage™ you may be worried about getting fines when you try to pass closely by those pesky people who dare to use the roads that are mandatory for them to use on “traditional bikes”. Don’t worry you can swipe as close as you like to teach them that they should also purchase a Revvy – we don’t really plan on enforcing that 1m passing rule when you travel using a 1 tonne Revvy. You can also rest assured that you don’t have to worry about fines for “riding furiously” because we guarantee that you won’t win the Strava M2 segment when sitting in traffic in the Revvy-sized lane on the M2. If you’re worried about where to store the Revvy because you already have a car or you don’t have a garage then never fear – that’s why we invented Street Space™ so that you can take up a lane of road even while you’re not using the Revvy! Hurry now and get your 2016 Commemorative Edition NSW “Revvy” Bicycle – we’ll only be producing 60 million this year and every minute without a Revvy you could be spending a fortune on fines, falling behind on your CO2 emission targets, breathing too much fresh air and wasting the opportunity to use your fair share of Medicare. Get in quick and you’ll get the Revvy for the low low price of $39,990 ride away, no more to pay (except yearly rego, insurance, quarterly servicing, weekly refuelling BUT no extra costs for the roads because that’s already been paid for by a combination of stamp duty, council rates, GST and income tax). If that sounds pricey then don’t worry we also have financing with extra tax breaks to make it affordable to own a Revvy at the cost of everyone else in society and increasing your already high debt load. We want you to be safe. Stay tuned… Next year we’re introducing the Pedestian Face Tatto™ and Road Roller Motorshoes™ with our trademark Metal Safety Cage™ technology to improve the safety of all our free³ citizens. This is a satirical piece and not intended to be nuanced (that’s what I spend the rest of my time doing). The Metal Safety Cage™ and other safety features of the Revvy do not aid the safety of other road users⁴. Who cares? It’s everyone for themselves right? I fear for the people who need the satire disclaimer on an article to aid their comprehension. I refuse to put that into anything I write. I’ve had more than one argument on Reddit with someone who didn’t understand.